IN some respects the Vickers "Vagabond" light biplane two-seater, designed by Mr. Rex Pierson, is a good deal similar to last year's "Viget" single-seater. In the main ДальшеMore>>> the forms of construction employed are the same, and even the general appearance, although differing from that of the "Viget," bears a strong family resemblance to the smaller machine. Owing to pressure of work at the Vickers Weybridge works the "Vagabond" was built by A. V. Roe and Co. at their Hamble works, the machine being sent to Weybridge for finishing off and covering. 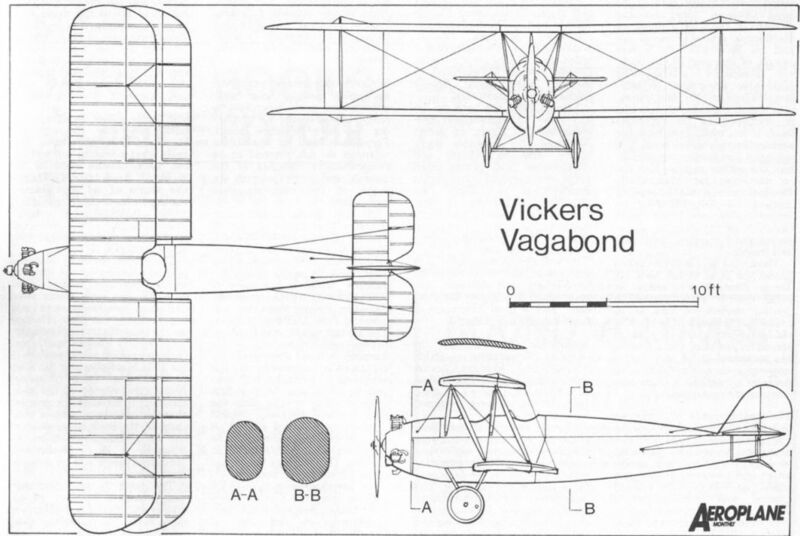 The Vickers "Vagabond" is an equal-span tractor biplane, characterised by a very pronounced stagger, and by the fact, as distinct from the majority of machines entered, that the bottom as well as the top of the fuselage is faired. 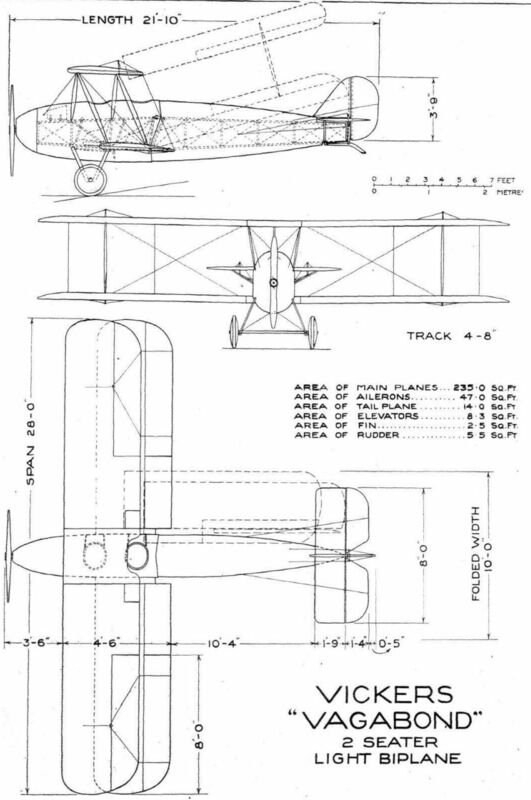 The main stress-resisting portion of the fuselage is fairly shallow, as indicated by the dotted lines in the side elevation of the general arrangement drawings, and as shown in the views of the machine in skeleton. It is a girder of spruce longerons and struts, braced by tie-rods. The fuselage fittings are of Duralumin, and are identical with those used on the "Viget." They entirely surround the longerons, and are slid on from the end. The details will be seen in Fig. 2 of the accompanying set of sketches. A peculiar feature of the fuselage design is that the top and bottom fairings of the fuselage project past the vertical sides, so that the fabric does not touch the sides of the actual fuselage structure. A particularly smooth surface should result from this, arrangement, but, on the other hand, it would appear that when handling the machine on the ground considerable care will have to be taken not to damage anything, as the more substantial parts of the structure are not available for lifting. The most original feature of the fuselage structure, however, is that the tail portion, from behind the rear cockpit to the stern post, is separate from and hinged to the front portion. 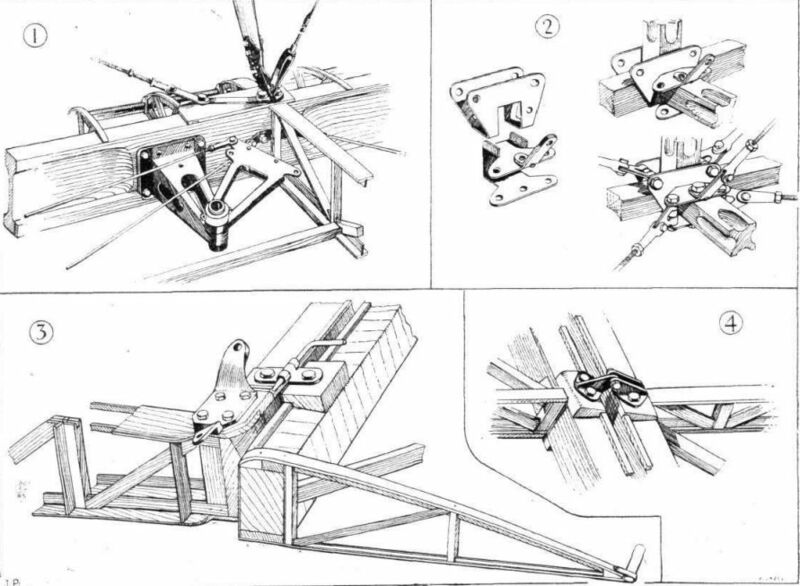 The hinges occur on the lower longerons, while the joint in the top longerons is in the form of a worm and nut gear, which can be operated from either of the two cockpits. The effect of rotating the worms is to lengthen or shorten the top longerons, and thus the tail is lowered or raised in relation to the front portion and wings. Thus for landing the tail will be raised, when the wings make a very large angle with the ground, which should materially assist in pulling up the machine after a very short run. The arrangement, it will be seen, combines the advantages of a trimming tail and a variable incidence. The wings are of normal construction, with spars of I-section spruce and N-formation ribs. Drag bracing is by tie-rods. The inter-plane struts are of spruce with steel end fittings. The ailerons are operated by tie rods and cranks, no pulleys being employed. The wings are designed to fold, but owing to the very pronounced stagger some unusual features have had to be incorporated in order to make the folding possible. From the side elevation in the general arrangement drawings, it will be seen that the effect of the stagger is to swing the wings upwards when folded. In order to reduce this angle the top hinge is not on the rear spar, but on a specially reinforced three-ply box structure some distance aft of the spar. 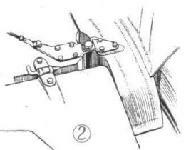 The bottom hinge is on the spar, but the hinge pin is placed at a considerable angle with the vertical plane of the spar. The top plane does not require any special preparation before folding, except to fold the trailing portion of the centre section, but the lower plane trailing edge has to be folded up or down in order to clear the fuselage in the folded position. Consequently, portions of the trailing edge have had to be made to hinge up or down, and special L-shaped locking pins of the form shown in Fig. 3 are employed. These are locked in place by "safety pin" wire locking devices. The undercarriage is of the plain V-type, with rubber cord shock absorbers. Special wheels, with ash rims and double-diagonal mahogany sides, have been built for the machine, and their shape is such as to offer the least, possible resistance. At the moment of writing it is not definitely known what engine will be fitted, but it is hoped to be able to obtain the information in time to include in the table of particulars given on p. 588, to which, therefore, we would refer our readers for information concerning the engine. 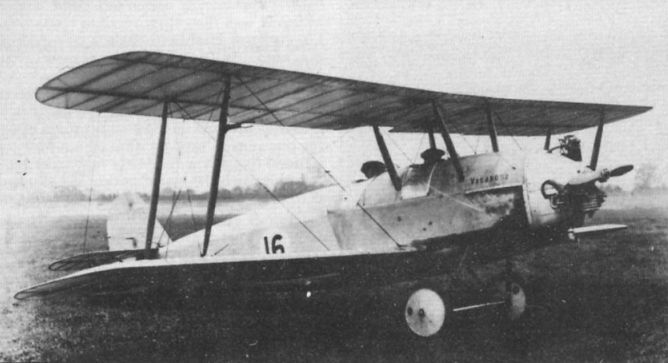 The Vickers "Vagabond," as already mentioned, was built at the Avro works at Hamble, and the workmanship is very good, and quite up to the very high standard set by Vickers themselves in the case of the "Viget," which was generally admired for its excellent workmanship. 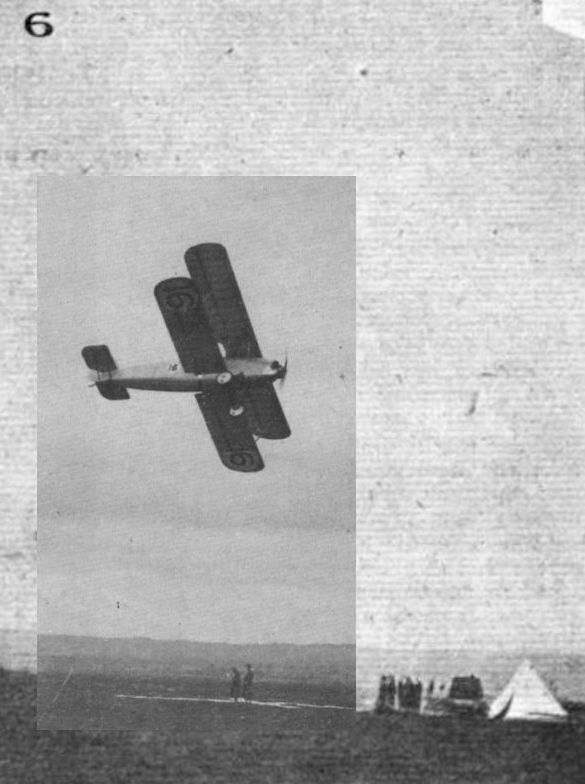 THE LIGHT 'PLANE RACE FOR THE GROSVENOR CHALLENGE CUP: 6, Payn on the Vickers "Vagabond." Ironically it was only after it had been eliminated from the trials that the Vagabond began to perform properly. It is seen here being flown by Vickers test pilot Sqn Ldr Payn. The Vagabond photographed at Brooklands in the summer of 1924. VICKERS VAGABOND. 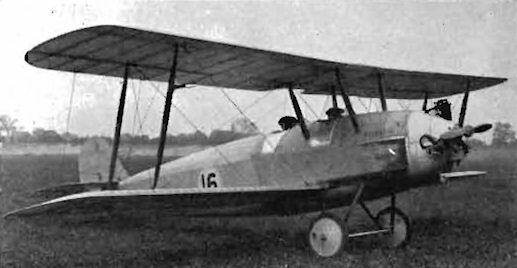 A light tandem two-seat biplane, the Vickers Vagabond was built to compete in the Lympne light aeroplane trials. As Vickers were very busy at the time (1923), and factory space was at a premium, they sub-contracted the construction of the Vagabond to Avro's at Hamble - the machine being finished off and covered at Weybridge. The engine was a Blackburn three-cylinder radial, although the Cherub or a similar unit could also be fitted . Span was 28 ft., length 21 ft. 10 in. ; height 9 ft. 5 in. ; wing area 224 sq. ft. ; gross weight 887 lb . ; and speed range 33-77 m.p.h. The Vagabond at the Lympne trials during the last week of September 1924, where it was flown by Sqn Ldr Payn. The Vagabond was built by A. V. Roe at Hamble and it was prooably in the state pictured at left that it was delivered to the Vickers Weybridge factory. THE VICKERS "VAGABOND": Three-quarter rear view of the machine in skeleton. SOME MORE CONSTRUCTIONAL DETAILS FROM LYMPNE: (2) Spar and flap hinges on Vickers "Vagabond." Note the joint in the fuselage which allows of setting the angle of the rear portion. SOME VICKERS CONSTRUCTIONAL DETAILS: 1. The aileron crank inside me wing, giving a differential movement to the ailerons. 2. Details of the fuselage fittings. These are similar to those used on the "Viget" 3. The trailing edge is folded with the wings, and is secured by hinges of the form shown. 4. An aileron hinge.